[KH] 20: Fire keeps dying down right-hand side near knuckle. May have leaking foundation ring rivet. Needs investigating when cold. There were several Stanley steam cars in Toddington car park today - not a planned event as far as I am aware. Gil arrived first, and was tackling issue 20. That is, with dust mask on, he was raking the ash through the fire bars into the ash pan. David Moore offered to help, but finished up acting more as gopher, I think! Nevertheless, between them, they cleared the grate of ash and removed a couple of firebars to expose the foundation ring and inspect the rivets. Gil checked both sides (just in case) but could spot no problem. Carpo was called in to check. He found nothing, either. Carpo (as Boiler Responsible Person) gave it a clean bill of health and told Gil to fit the bars back. No further action to be taken. Bruce appeared and decided to tackle the seized nut of issue 19. This bracket has a countersunk screw head, which is a challenge to hold steady. To make matters worse, the counter-weights on the driving wheel were totally covering the seized nut. Bruce had previously made a suitable "screw driver" out of a length of flat metal bar for a similar task - now where did he put it? Bruce and I searched round, checking likely drawers and shelves. Well, no big problem, there was time to make another while waiting for the loco to be moved (to gain access to the nut). 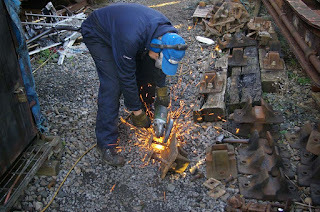 I began to clean up some rail chairs, as the production line of boot scrapers was empty. Bruce popped his head out of the TPO: "Found it. It was in the screwdriver drawer". It was a warm day (!) and inside an overall it was decidedly uncomfortable, so I discarded mine (but retained my shorts & T-shirt). I got covered in grot from the chairs (a couple were a tad greased-up), necessitating a heavy wash cycle … whoops, they're still in the machine; I'll just go and hang them out …..
…. [back again] I only managed to clean 6 chairs. Restocked F&W with 2 boot scrapers and the Coffee Pot with 3. Re. issue 20, the consensus view is that it was more likely clinker blocking the fire bars and causing the fire to deaden! Most of the remaining issues are boiler-related (hence can only be done by Carpo, or under his supervision). None are serious, so these will wait until boiler wash-out time (that is, after 30 days' steaming). A Hymek (D7017) arrived just as I was leaving. I had to pop down to "borrow" my glue gun to do a job at home, so painted the six bottoms while I was there. The Hymek was moving - I don't think I've ever seen one operating before. Diesel gala commenced. I was crossing monitor at Winchcombe station. It was wonderful there when there were no trains in the station - peaceful, quiet, birdies tweeting, sun shining, tea & cake from the Coffee Pot. Finished reading my Steam magazine.